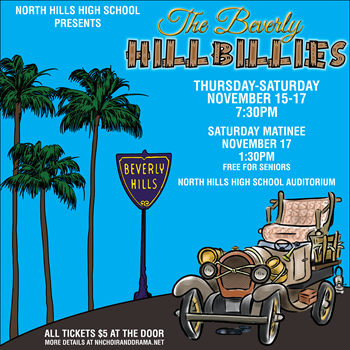 North Hills High School Drama Club will present “The Beverly Hillbillies” on Nov. 15 to 17 at 7:30 p.m. in the North Hills High School auditorium. A special free senior citizen matinee will be held on Nov. 17 at 1:30 p.m.
Tickets for the evening productions are $5, and tickets can be purchased at the door for all performances. Senior citizens who reside in North Hills School District may attend the matinee for free on Nov. 17 at 1:30 p.m. by reserving a ticket. To reserve a senior citizen matinee ticket, contact North Hills School District Activities Coordinator Chelle Zimmerman at 412-318-1438 or zimmermanm@nhsd.net.